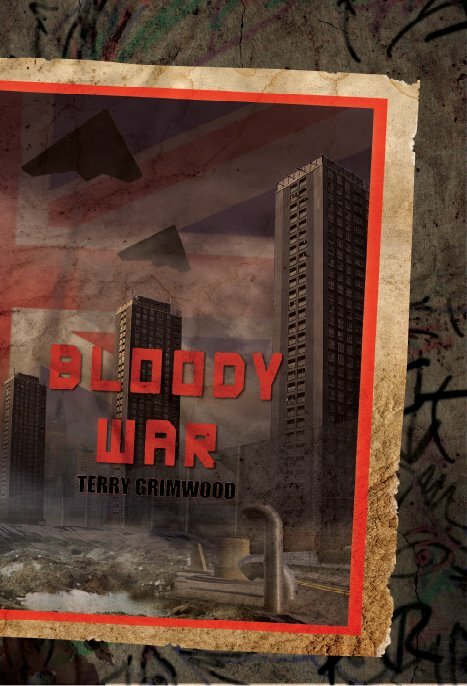 Terry Grimwood, Bloody War. Eibonvale Press, 2011. Pp. 276. 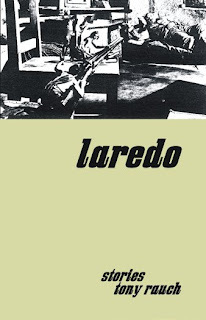 ISBN 978-1-908125-03-3. £8.99/$15.00. 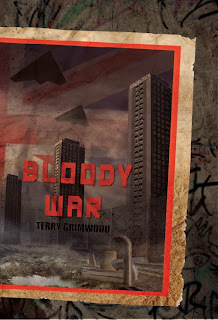 Bloody War is a new novel by Terry Grimwood and published by Eibonvale Press. Set in the not-too-distant future, the book is a dystopic vision of a gritty modern-day London caught in the middle of a brutal war. The aggressors are the unseen and unidentified Enemies of Democracy (EoD), and it would appear London suffers nightly air-raid attacks and is under perpetual threat of invasion. At the centre of the novel’s bedlam is protagonist Pete Allman. Readers follow his narrative stream-of-consciousness as he wakes up with amnesia, befuddled by the existence of this 18-month old conflict. It is this slightly unbelievable, yet wholly forgivable, narrative tool which permits the reader the same sense of intrigue and discovery as Pete as he attempts to get to grips with his predicament. A significant feature of Pete’s life is his family, and his concern for them amidst the falling bombs and the nostalgic social pluck drives most of his actions and behaviour. It is the focus on the individuals, and the avoidance of wider ideological concepts that differentiate Grimwood’s text from that of Orwell’s Nineteen Eighty-Four. It would seem very much to be from the perspective of Pete the proletariat, rather than Winston Smith’s party affiliate, and this view has a certain vitality and freshness. Pete is almost stereotypical in his modern ‘Allman’/‘everyman’ status; middle aged, wife, family and stable job. I would suggest the author was at pains to present Pete as almost a nobody, a virtual invisible—much like a Winston Smith. Pete is permitted a few interesting character components which are interesting; he is a reformed bad-boy, very much a biker (a proper one too—not a mid-life crisis suffering one!) and he still wears his hair long. The text is littered here and there with references to the old heavy metal bands of the 1970’s and 80’s and, while I might be wrong, I got the sense the author was indulging himself a little bit with this repeated inclusion! This in no way detracts from the novel; rather it adds depth to Pete’s character. Due to the protagonist’s background and subsequent regrets, I found him a little maudlin at times as it seemed that he had never quite forgiven himself for his prior wrongdoing, and thus while he worries about his family, his personal feelings very much dominate his rhetoric. While this doesn’t entirely endear a reader, it perpetuates his depth and realism—and it is his realism, and realistic reactions to the devastation around him, which helps immerse the reader within the novels pages. The atmosphere of the novel endeavours to replicate that of a World War 2-era London, and the clichéd phrases “There is a war on!” become post-post ironic. They words sit ill at ease with the reader as now the biting clichés are no longer funny. It contributes to the absurdity of the predicament Pete finds himself in. Perhaps the idea that London is being bombed in the 21st Century veers on both the sublime and the ridiculous. But this is the point, war is ridiculous and the novel makes this assertion with endearing aplomb. The reader is drawn to challenge: is the author really trying to pull this off?—that is, the transition between modern-day peacetime, resplendent with nuclear deterrents and special relationships to one where the United Kingdom is under constant attack and with little voice of contention? The almost unfathomable nature of this position is however matched by Pete’s own genuine bewilderment at the situation, and subsequent lack of answers. There are a number of times I wished Pete would grab someone by the lapels and ask what was happening but he never does this with conviction, instead the story is unravelled over the pages of the novel rather that the brisk conversation a reader might demand in the same situation. While this might frustrate someone demanding immediate answers it also allows the picture to be painted fully by the end of the novel. This captivates the reader in the dystopian society Pete also exists in and it is this tangibility which negates the virtual impossibility of the situation. The novel roars along at a blistering pace and there are plenty of cliff-hangers. I read the book in two sittings but many readers will require only one. It is very difficult to elaborate on the plot at too great a depth without releasing spoilers, but the novel is packed with twists and turns and these continue until the final page. I must admit I worked out one major twist quite early on in the novel but the audacity of the author to follow this through should be applauded. Some of the ideas are both ridiculous and conspiratorial, but the author delivers them so well this doesn’t seem to matter. The narrative is engrossing and the plot devastating. I would not necessarily call the writer a ‘wordsmith’ as such—the prose is basic but very well written. He is however, in my opinion an incredible storyteller and crafter of intrigue with a vivid imagination and the ability to keep readers on the very tip of their chairs. I think it would be unfair to wholly compare Bloody War with its, in my mind ‘big brother’, Nineteen Eighty-Four. It lacks the intrinsic political ideology and linguistic expertise abundant in Orwell’s novel. I think however, this is what makes this novel a humbler experience, it isn’t trying to be altogether original yet it puts a modern twist on something many readers will already be familiar with. While this in no way lets the story down, it does perhaps limit it as the political ramifications are never completely explored. Part of me didn’t think the novel lacked anything specific in this regard—after all, it would appear the author was keen to present an individual’s tale rather than a grand political narrative. However I might argue that the individual focus restricts the discourse around the events the novel visualises, there are no new themes to come from the text, instead it’s simply a different take, albeit a very rewarding take, on the conventional tomes of dystopian texts. Both refreshing and disturbing, Bloody War is a speculative gem; an honest, well written ‘What If?’ novel. It proposes an old fashioned war coming to modern-times London and describes deliciously the societal vacuums and issues this creates. The character of Pete Allman is a good vehicle for moving the plot forward as he grows impatient quickly and his temper bristles the novel along at quite a pace. The book is highly enjoyable, and while it doesn’t fully engage with the dystopian social politics it presents an engaging individual war-narrative with an increasingly tumultuous plotline. As much as Pete is a virtual Orwellian proletariat, I’d very much like to read a Grimwoodian Winston Smith. Magnificent Monsters: Sein und Werden #7.2, April 2011. Pp. 64. ISSN 2046-8601 (print) / ISSN 2046-8598 (web). £4.50. Magnificent Monsters is a slim home-made volume, only 64 pages, but packed with stories and poems from the comic to the sinister. This issue has a striking cover illustration by Dan Cvammen and is printed on lurid green, rather thick paper—so thick in fact that it needed not just one but two jam pots to hold it open on the breakfast table. 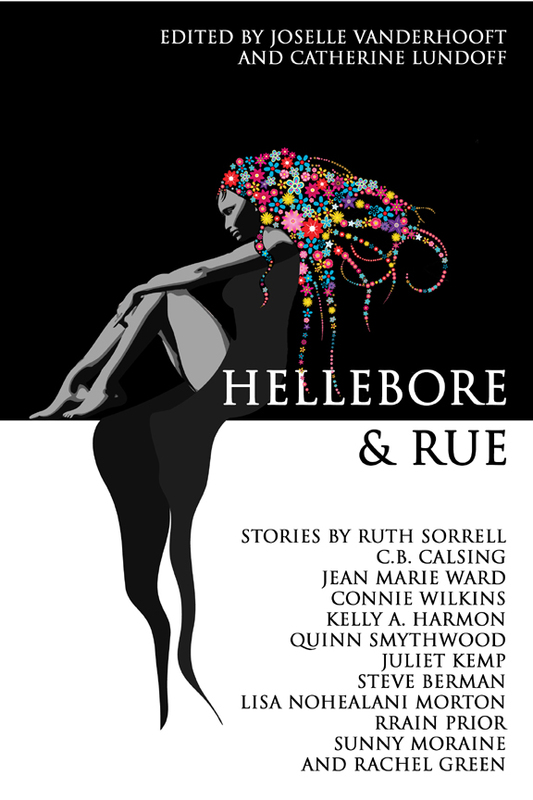 Catherine Lundoff and JoSelle Vanderhooft, Hellebore and Rue: Tales of Queer Women and Magic. Lethe Press, 2011. Pp. 238. ISBN 978-1590213773. $15.00. From a servant girl with healing powers to a witch detective who uses demons instead of a computer to solve cases, the stories in Hellebore and Rue have a nice range of settings from medieval through modern. There is also a nice mix of locations from both sides of the Pond, with very identifiable North American and English backdrops. The stories range from “good” or white magic to black magic. Overall, the editors selected a nice sampling of stories. I was looking forward to what looked like it should be an interesting exploration of female relationships in occult settings. I was somewhat disappointed that almost all of the stories involved a less than happy relationship between the lovers, and most worked from the premise of the two women having ended their relationship. It sometimes seemed that the relationship aspect was thrown in as an afterthought rather than an integral part of the story. Most of the relationships end at the beginning of the story, very often due to the main characters choosing to continue the use of their magical abilities. The impression from the collection as a whole is that a lesbian woman can’t have her magic and a relationship too, which is just so the opposite of what I was looking for in an anthology styled as “Tales of Queer Women and Magic”. The collection wasn’t nearly as strong in the “queer” aspect of the stories as I would have expected. This observation isn’t necessarily a criticism of the editors, as I have seen how difficult it is to get quality pieces that portray healthy lesbian relationships. This is more my call to writers to step up—there’s a lot of opportunity here! The magical aspect however, was very rewarding. Had this been a book about “Women and Magic” it would have been exactly what I expected. The first story, ‘Counterbalance’, got my hopes up. Even though it is written in an abstract third person voice, the relationship is just what you would expect to actually see in real life—a little bickering, a little forgetfulness, but always there for each other. It also showed more of what I expected from at least a few more of the stories, but didn’t find. ‘Trouble Arrived’ was probably the most “traditional” magic story from an American standard. This one was the best in the anthology at pulling me into the narrative and almost making me feel like I was in the story. This may be partially due to having been to Louisiana, so I could really picture the marshy backwoods the story it is set in. ‘Personal Demons’ felt like it could have been a story from my family, which has been inordinately obsessed with demons and possession. The relationship aspect of this one was confusing and actually detracted from the story for me. I expect the intention was to convey a conflicted relationship, but it came across more as a confused relationship. The mix of a traditional Judeo-Christian approach to demon possession and exorcism combined with Eastern philosophy was unique and brought a nice, fresh touch to this piece. ‘Sky Lit Bargains’ was the most traditional, expected sword-and-sorcery tale. The story had some inconsistencies that would lead me to believe that it had originally been written as a traditional sword-and-sorcery with a hero which was lightly modified to have a heroine to submit to this collection. It was very difficult to get any sense of a relationship other than mistress and servant from this story. ‘D is for Delicious’ was definitely the most “creepy”. It made me stop and think for a moment about visits to the school nurse during my grade school days. And you won’t be able to look at the sweet little ladies at the nursing home the same ever again. But again, the lesbian aspect of this story was a brief implied romance rather than an integral part of the plot. ‘And Out of the Strong Came Forth Sweetness’ had the strongest relationship element of the stories in this volume. The magical part of the narrative was actually more minor in this one, which was a refreshing change. It was also one of the two pieces where the relationship continued past the end of the story. ‘A State of Panic’ was my favorite piece in this collection, combining magic with a “whodunit” story—until I got to the end, which could have used a bit more work. As it was, I found myself transported from a maelstrom with Pan in a woodland glade to a tired row house with just a few words—and not particularly magical ones. I did really enjoy the complication of using magic in a modern, computerized world. The juxtaposition is rather unusual in magic stories and was well handled. I enjoyed reading this anthology. The variety and quality of the stories was good. 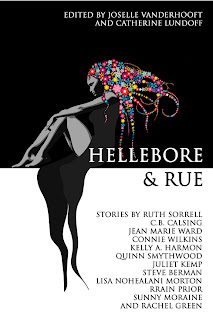 My only disappointment was that Hellebore and Rue had the opportunity to lead the charge in lesbian literature. Instead, this is a nice collection of stories of female magickers, with nods to the queer aspect. 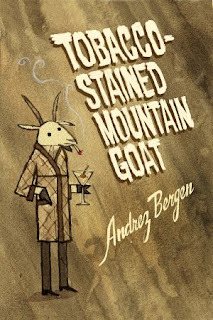 Andrez Bergen, Tobacco-Stained Mountain Goat. Another Sky Press, 2011. Pp. 236. ISBN 9780984559701. $4.74. Tobacco-Stained Mountain Goat follows a man named Floyd through his daily life in the last city left on earth, Melbourne, Australia. Sure, other cities still exist, but you wouldn’t find anything alive in them. Every single living being left on the planet after a catastrophic viral outbreak has been walled into one supremely urban area. So, how does a government keep such a place from becoming dangerously over-populated and chaotic? Well, they don’t, really, but they attempt to control it with rampant streams of propaganda and fear-mongering. The dim and gritty atmosphere is expertly set, using a massive amount of references to film noir and pop culture, courtesy of our narrator’s nostalgic love for film and all things reminiscent of simpler times. This made me a tad nervous at first; I worried about missing too many subtle cues and allusions. Luckily, the book does include a few appendices, including a handy list of recommended movies, so I watched as many as possible beforehand. ‘As many as possible’ turned out to be only four, but it was good enough, and the first, The Third Man, was really the key reference. As the story progressed, I realized the worry was groundless, although a familiarity with the movies certainly does add to the mystique. If you’re a movie buff, you’ll enjoy the abundance of nods to great movies and literature, but if you’re not, you’re likely to leave this book wanting to become one. The author even makes a few amusing references to his own record label, If? Records, where he records under the pseudonym Little Nobody. The first pages of Tobacco-Stained Mountain Goat are a bit confusing as Floyd tells about a recurring dream that plagues him; once you sort out what’s dream and what’s real, though, the flow picks up the perfect tempo for the tale. Floyd’s common decency and inarguable sense make him an appealing character that’s easy to identify with. He’s the perfect narrator for this story; the perennial underdog, an average guy forced to make his way through difficult circumstances. He often feels he can’t do anything about his position in life and is at times suicidal, but he struggles through as best he can, bullied into being a hired-henchman for a government which has done nothing but take away the people and things he loves. This book does a fabulous job of highlighting the complexities and dangers of current world social, economic and political climates. As one monolithic corporation wiggles its fingers further and further into the political realm and manipulates its way into the hearts of the general public, Floyd is unwittingly pulled deep into the propaganda machine, giving us a singular behind-the-scenes view of what is quickly beginning to feel like some warped, twisted three-ring circus. As the boundaries between government and corporation become ever less defined, selling the people mouthsful of lies while convincing them it’s food, the people eat it all up. It doesn’t even matter anymore if people recognize the lies, because they’ve become so enamored of the people spouting the drivel that they actually rationalize it all and defend them. – Eat it up, little doggy, there’s more where that came from. This is my first review for The Future Fire, and I couldn’t have asked for a better book to begin. The only fault I can find with this book, is after such a compelling, well-written narrative with fantastic imagery and a perfectly set tone, the flow falters at the end. The entire story seems to trip over some huge boulder, like The Flying Nun doing a face-plant, and it never really recovers. The author seems to try to tie everything up so neatly it’s painful, but then you can almost pick out the exact spot where he said, “ah, screw it,” and tossed in a handful of arbitrary questions to leave open, instead. The commentary on the current socio-economic and political climate is dead on without ever being overbearing, woven perfectly into the tapestry of the story, but the author makes no real effort at a lasting solution, opting instead for a quick and easy way out. Like this. Uncomfortable, isn’t it?